Custom Athletic jerseys and uniforms with quick turn around time. Kirkwood Trading Company has always been more than just a custom t-shirt shop. In addition to screen printing custom tees for the past 20 years, we have also been one of the areas leaders in custom athletic jerseys and jerseys. Hailed by our clients for our super fast turn around times, we are a company that has been asked to step up time and time again where others have failed. To us, a team having to start the beginning of their season without their jerseys is absurd. Listen, no company is so bogged down that they can’t put in a little over time to meet a customer deadline. Meeting customer deadlines is the one reason companies like ours stay in business. Perhaps that we print in-house and do all of our lettering and numbering in-house gives us a step up but really you are saving money as well. Kirkwood Trading Company offers a full line of athletic jerseys and uniforms from a few main sources of athletic companies and brands. We offer a variety of options for just about every sport for both youth and adult. In addition to styles and materials we also offer several color combinations to meet the needs of your team colors. Jerseys come in both youth and adult, male and female and we can customize them to fit your needs in your time frame. Whether it’s girls volleyball or high school hockey. We have the modern jerseys and materials you are looking for. We provide the best options and best everyday brands for custom athletic uniforms and jerseys and we can print to your specs. The ordering process is simple. Let us know what you are looking for and in what colors. From socks to hats we can outfit your entire team or entire organization. While our average turn around time on custom t-shirts is 4-6 business days, usually we can complete jersey orders in that time. Sometimes a team wants socks, pants, jerseys, and hats. On occasions such as these we will still have your order completed in 10 business days. It’s a matter of the location of the items relative to us and what we are doing on them. 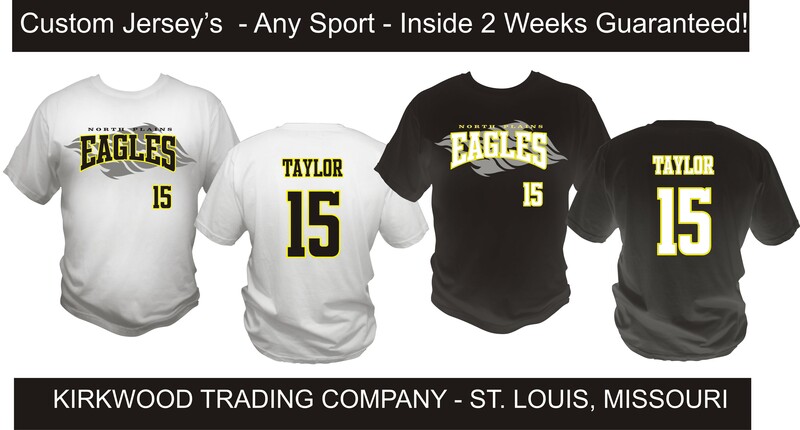 If we are printing numbers on pants, jerseys, and hats in addition to printing, that takes a little extra time but again, our orders are completed inside 10 business days for custom jerseys and athletic apparel.